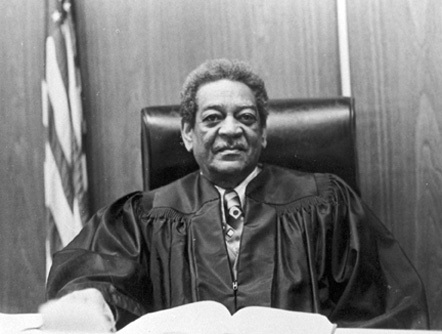 William Gaston Pearson, II (1915-1985), received his undergraduate and law degrees from North Carolina Central University, finishing law school in 1954. He went into private practice and in 1968 founded Durham’s first black law firm, Pearson, Malone, Johnson, & DeJarmon. Throughout the 1960s and 1970s, he traveled the state with his law partner, C. C. “Buddy” Malone, fighting civil rights cases at both the state and the federal level. In 1977 Governor James B. Hunt, Jr., appointed Pearson to fill the vacancy left by retiring chief district court judge E. Lawson Moore, making him the first black district court judge in the state. He won the next two elections in 1978 and 1982, before retiring at the age of 70. His kindness, dedication and compassion influenced my life in many positive ways. He helped teach us all that a courtroom should not only be a place for law but that it should also be a place for social justice. Pearson was instrumental in forming the George White Bar Association, a fraternity of mostly black lawyers in Durham County. He was an active member of many professional and civic organizations: president of the George White Bar Association, member of the North Carolina Association of Black Lawyers and the Durham Committee on the Affairs of Black People, and a cooperating attorney with the Education and Defense Fund of the National Association for the Advancement of Colored People.